“A Brief History of the Future” was a series of three films by Finnish artist, Mika Taanila, that explored the recent historical perspective of predictions about the future as part of the Singapore Fringe Festival ‘08. Conceptually, it is very interesting, considering how quickly things become a part of history today and the amount of archival information out there that can be collated into a documentary. In a sense, the future is not simply looking forward, but we are challenged to look further back to see further ahead. 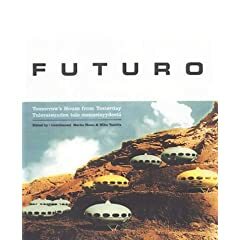 Futuro — A New Stance for Tomorrow (1998) traces the development of a plastic weekend cottage (left) that was meant as the homes of the future but ended up becoming a novel toy that has since been forgotten. In fact, after I first saw it, I was not sure if it was actually a documentary or a piece of imaginary art. The design of the homes seemed surreal yet never that far out of place from reality. Optical Sound (2005) explores the development of an electronic music instrument which was a tad draggy at times. But it was interesting to see how the hippie culture drove a lot of its development and what they seemed to be doing was an attempt to translate human movement into electronic signals. The Future is Not What It Used to Be (2002) follows the life of Finnish nuclear scientist/artist Erkki Kurenniemi in his massive project to collect everything revolving around him — from receipts, to photos, recordings — in an attempt to re-create his human soul. He extends this concept of body-mind duality and suggests that it is this soul which should be preserved such that it can fill any artificial form (body) that we create in the future. At one point, he says something along the line, that if science fails to awake a frozen body, at least we can re-create the human soul with all the things he is collecting. These works by Tannila really depicted how the predictions of the future in the past turned out today and give a better picture of where we might or should not be heading. The video of Kurenniemi got me thinking and he seems to suggest that the creation of the artificial container of the human is inevitable and the last frontier we have is what we term the “soul”, and at times it seemed like he was on this one man battle to either preserve the last frontier or really create a resource that can be used in the future as the creation of an artificial “soul”.